But today, with US influence diminishing due to the drawdown of operations by the North Atlantic Treaty Organization (NATO) in Afghanistan, the Eurasian region is increasingly coming under contention between China and a resurgent Russia: the former offering prosperity via its “One Belt, One Road” infrastructure projects, and the latter relying on longstanding political ties and security concerns. 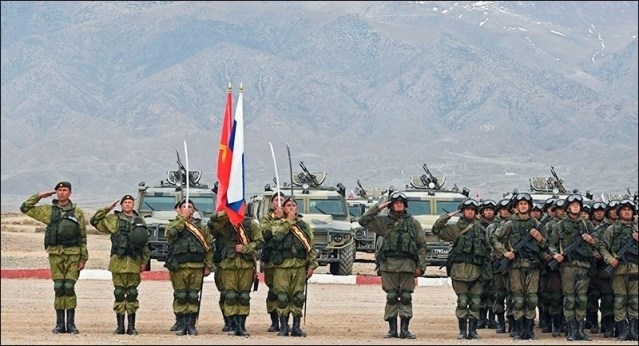 After Kyrgyzstan closed the US airbase at Manas in 2014, Russia subsequently increased efforts to solidify its presence in the mountainous Central Asian republic to counter the seemingly inexorable growth of Chinese “soft” economic power there. Most recently, on March 28, 2019, Russian President Vladimir Putin made a state visit to Kyrgyzstan, armed with a slew of economic agreements. At a joint press conference following discussions with Putin, Kyrgyzstani President Sooronbay Jeenbekov told journalists that the two leaders “signed an impressive package of bilateral agreements that meet the interests of both countries and aim to bring our relations to a new level,” although he did not provide specifics (Kremlin.ru, March 28). Russian-Kyrgyz relations began more than 150 years ago with the absorption of the latter into the Tsarist Empire. But due to its relative poverty and isolation after gaining independence from the Soviet Union in 1991, the government in Bishkek retained certain strong links with Moscow, even as newly acquired statehood offered other opportunities. Since 2003, the Russian Air Force has used Kant Air Base (located about 20 kilometers east of Bishkek), established under the auspices of the Moscow-led Collective Security Treaty Organization (CSTO). Two years earlier, in late 2001, the United States sought and established an airbase in Manas as an element of its “war on terror” in Afghanistan. The US military maintained its presence in Kyrgyzstan until 2014, a departure heartily welcomed by Moscow. During Putin’s visit to Bishkek last month, the two countries agreed to not only expand the Kant airbase by 60 hectares but also increase Russia’s annual rent from $4.5 million to $4.79 million (Regnum, March 28). The scramble for air bases encapsulates the factors dominating the Kyrgyz Republic’s post-Soviet foreign policy. The uncomfortable reality for Kyrgyzstan is that the country is too small, too isolated and too poor to be economically viable without considerable outside assistance. Furthermore, Kyrgyzstan is surrounded by volatile forces and issues capable of destabilizing the region, from the transnational drug trade to terrorism, leaving the country more likely to seek help from the international community than to contribute to it in any significant way. Moreover, low wages combined with a lack of economic opportunity at home has impelled many able-bodied Kyrgyzstani men to seek employment abroad. Even though, in 2018, domestic wages increased by 4.2 percent to roughly $230 per month, in January 2019, the Kyrgyzstani State Migration Service reported that 750,000 Kyrgyzstanis work outside the country, with more than 640,000 in Russia (Gazeta.ru, March 31). Other Kyrgyzstani guest workers can be found in Kazakhstan (35,000), Turkey (30,000), the US (15,000), Italy (5,500), Germany (5,000) and South Korea (3,500) - from a national population of only roughly 6 million people. Remittances from Kyrgyzstani laborers in Russia are critical to the domestic economy; in 2018, expatriates sent home to Kyrgyzstan more than $2,685,000,000 - 8.2 percent more than in 2017 (Regnum, April 3, 2018). Of this, more than 98 percent came from Kyrgyzstanis working in Russia (Regnum, February 15, 2019). The World Bank, in 2017, cited Kyrgyzstan as the Eurasian leader in terms of the ratio of the amount of remittances to gross domestic product (GDP), placing the ratio at 37.1 percent (Worldbank.org, October 2017). Ironically, according to Zhenish Moldokmatov, the leader of Kyrgyzstan’s extra-parliamentary Zamandash party, there are more than 100,000 illegal labor migrants working in the Kyrgyz Republic, 90 percent of whom are Chinese citizens. That number is more than twice as high as the government’s official statistics would suggest (Vesti.kg, January 10, 2019). Beyond labor disparities, another area where Russia has an advantage over China is the level of anti-Chinese sentiment among Kyrgyzstanis regarding China’s real intentions toward their country. Following an anti-Chinese demonstration in Bishkek, on January 7, President Jeenbekov said, “We have to say ‘thank you’ to the Chinese side, working with us, providing assistance. Those who politicize, want to worsen international relations [and] damage stability… They will be held accountable under the law” (Gezitter.org, January 11). Suspicion of Chinese intentions particularly revolves around massive infrastructure projects, such as the China–Uzbekistan railway through Kyrgyzstan, under discussion since the mid-1990s (Ritmeurasia.org, March 8). The sticking point is that while China wants an east-west route, the Kyrgyzstani government maintains that a north-south link, connecting its Europeanized north and traditionalist south (where a large ethnic-Uzbek community lives and the influence of the Islamists is growing), remains the highest priority. Russia sees aid to Kyrgyzstan as crucial to its policy of retaining influence in the Russian “near abroad.” Their common history, legacy of integrated infrastructure, and comparable transitional challenges allowed the two countries to build strong economic relations that persist to the present day, giving Russia a comparative advantage not only over China, but the US and European Union as well. For Moscow, the prime question then is how to retain and even expand its dominance. Much of the transportation and communication infrastructure in Central Asia, including Kyrgyzstan, remains oriented northward, toward Russia. It will take significant long-term investment to overcome this. Bishkek has apparently concluded that its most pragmatic course for infrastructure development would be to include Russia in any Chinese-Uzbekistani railway transiting Kyrgyzstan (TASS, March 1). For thoughtful Kyrgyzstanis, the last few months may have provided a glimpse into Moscow’s clandestine agenda. During a February visit to Kyrgyzstan, Russian Foreign Minister Sergei Lavrov said that Moscow was amenable to discussing the possibility of opening a second military base there, if Bishkek was interested (Kabar.kg, February 4). For the present, Bishkek must look further afield for altruistic economic assistance.